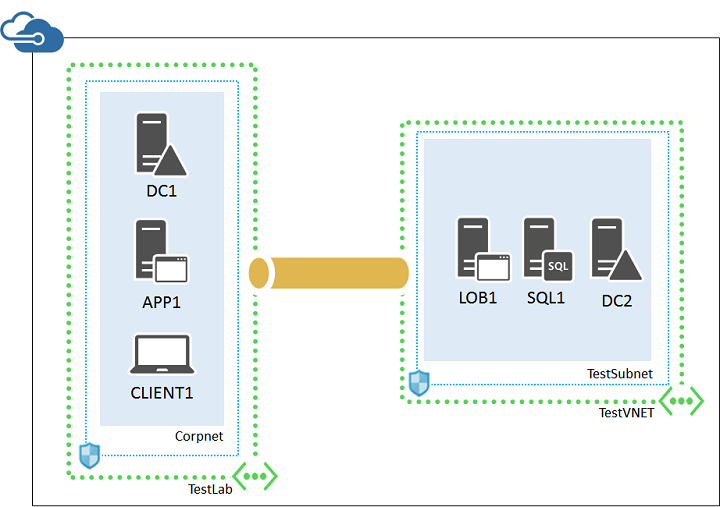 The Set up a web-based LOB application in a hybrid cloud for testing topic steps you through creating a simulated hybrid cloud environment for testing a web-based, line of business (LOB) application. This environment uses a VNet-to-VNet connection between a simulated on-premises network and servers running in an Azure virtual network. Here is the resulting configuration. Once you set up the servers and load up your LOB application on LOB1, you can begin experimenting with access from the CLIENT1 computer. Use this environment to gain experience with the creation and testing of web-based, LOB applications running from an Azure virtual network prior to deploying them in production.